It was certainly no easy vacation for 14 undergraduates who chose to spend their summer working on a wide variety of projects covering areas of particle physics, accelerator design and ways to improve x-ray optics for synchrotron research. 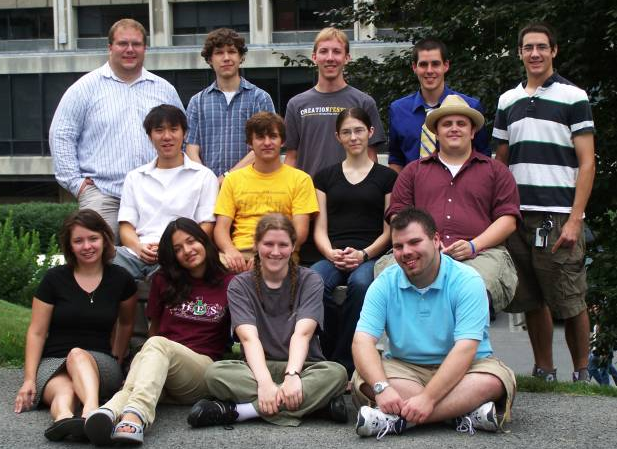 They came to Cornell as part of the 2007 Research Experiences for Undergraduate (REU) program, funded by the National Science Foundation, through an interlocking grant between principal investigators Rich Galik, professor of Physics at Cornell, and Claude Pruneau, professor of Physics at Wayne State University. Like the 150 students over the decade before them, this year’s applicants found no time for a leisurely pace on the job. Instead, the students were quickly integrated into real research and development on forward looking projects such as the International Linear Collider, a major future high-energy physics facility, and the Energy Recovery Linac (ERL), a new super-brilliant x-ray source being developed at Cornell. Back row: Benjamin Schmitt (Rochester), Pauli Kehayis (Roanoke), Henry Timmers (Wooster), Emmett Windisch (Wayne State). Middle row: Ken Soong (Cornell), Dan Carmody (CMU), Mackenzie VanCamp (Lawrence), Ron Lamberty (Notre Dame). Front row: Courtney Courveur (Wayne State RET), Paradis Niknejadi (CalPoly Pomona), Liz Olhsoon (Oregon), Christian Hammill (Wayne State). Following tradition, during the last week of their stay students prepare half-hour presentations to defend their projects in front of an audience of other REU students as well as their mentors, scientists and laboratory managers. This year the Tuesday afternoon session called to the stage four students whose projects related to synchrotron x-ray research and development of a future ERL x-ray light source. Henry Timmers, a rising junior from Wooster College in Ohio, spoke about “Laser Shaping for High-Brightness Photoelectron Sources.” Henry worked with mentor Ivan Bazarov, assistant professor in Physics, on a team building an electron gun brighter than any ever created. In the gun, laser pulses photo-excite electrons from a gallium-arsenide photocathode. In order to produce the smallest possible bunch of electrons, the laser pulse needs to be shaped properly in both time and space. Henry described designing and building refractive beamshapers (somewhat resembling Keplerian telescopes), with radially varying magnification. On a lab bench, he put together a fiber laser to convert the Gaussian lineshape from the laser into a flat-top in time and space. CCD images of his laser spots looked like a gentleman’s top hat, confirming his success. “Development of Control System and Applications for Modern Accelerators” was the topic covered by Benjamin L. Schmitt, a rising senior at the University of Rochester. He worked with scientist Bruce Dunham (ERL prototype project manager) and John Dobbins (ERL control system designer). Benjamin first gave an overview of how large accelerator complexes use distributed control systems powered by an open-source software package called EPICS, for Experimental Physics and Industrial Control System. EPICS is now used to control a number of large national laboratories and particle accelerators. He then discussed his work to create a laser positioning system that will direct a high-powered laser beam, such as that created by Trimmer’s project, onto a photocathode to create the shaped electron source. Benjamin built a prototype dual-axis alignment system, using NanoPZ piezoelectric actuators, that use position feedback signals from sensitive quadrant photodiodes to dynamically orient two steering mirrors. He wrote 35 EPICS base protocols, similar to subroutines or functions in standard programmers’ jargon, to control his laser positioning system. Christian Hammill, just completing his fourth year at Wayne State University, changed gears a bit to talk about vacuum technology on a project supervised by scientists Yulin Li and Xianghong Liu. His presentation, “Outgassing Of Stainless Steel Vacuum Chambers And The Vacuum Pumping Speed And Capacity Evaluation Of A Titanium Sublimation Pump,” covered aspects of how to create, maintain and measure extremely high vacuum. The photocathode chamber for the ERL electron source must be clean to much better than so-called “ultra-high vacuum” in order to prevent contamination; any residual gas in the chamber will be converted to ions by the high-intensity laser and electron beams; the ions then strike the photocathode and spoil its ultra-clean surface. The spoiled surface loses efficiency and capacity to create electrons. Christian performed systematic studies of recipes of high-temperature “baking” of stainless steel parts, which should remove trapped water and reduce outgassing, and he compared and verified methods to measure accurately small pressures and outgassing rates. Emmett Windisch, a rising senior at Wayne State University, worked with scientists Ivan Bazarov and Peter Revesz and engineer Jim Savino on a project ”Heat Bump Modeling in High Heat-Load X-Ray Optics.” A perennial problem for synchrotron x-ray sources is that they produce so much radiation that x-ray optics become overheated, strained and distorted. Most x-ray beamlines use silicon crystal monochromators to select particular wavelengths of radiation and focus beams onto scientists’ specimens. When silicon crystals are hit by high-powered x-ray beams, localized “heat bumps” result from thermal expansion of the crystalline lattice. Characterizing, reducing or eliminating these bumps will have a major positive impact on almost all synchrotron beamlines and will also help solve technical problems foreseen for the ERL light source. Further explanation of Emmett’s work is included here since it tied in nicely with a previous project on heat load analysis carried out by scientists Revesz, Bazarov and Alex Kazimirov. Just this past year the group developed a new method to use video image analysis to record thermal heat bumps in-situ at one of the CHESS high-power wiggler source beamlines (read about that project here [link will be provided]). The CHESS wigglers can produce tens to hundreds of watts of power incident on a few square-millimeters of silicon crystal surface. The new instrument showed it was possible to measure surface expansion from nanometers to microns. A typical heat bump raised the surface several hundreds of nanometers. The project Emmett worked on sought to combine x-ray source theory with finite-element analysis (FEA) modeling to help explain observed optics distortions.The missing piece Emmett added was a software macro for the MATLAB program. 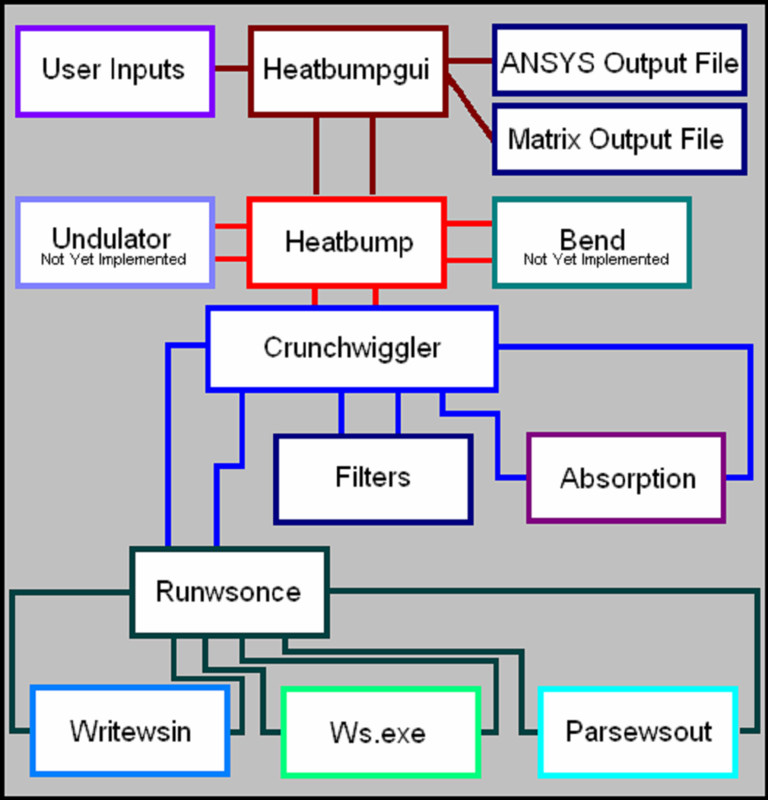 Flow diagram showing how Windisch’s “heatbump.m” MATLAB program (center, red) coordinates input from users (upper left), passes that to the external program XOP (through Ws.exe) to produce a power spectrum, applies filters and absorption, then outputs information on power density for the program ANSYS to use for finite-element analysis. The macro connects an x-ray theory program, called XOP, with a FEA program called ANSYS. His program, “heatbump.m,” allows the user to put parameters into a graphical user interface and then call XOP to calculate the radiated power spectrum from the x-ray wiggler source. Heatbump.m then applies appropriate filtering and attenuation to the power spectrum and outputs a matrix of values corresponding to the power deposited throughout the three-dimensional volume of the silicon crystal. ANSYS uses the deposited power to calculate the response of silicon, taking into account materials parameters such as thermal expansion, attenuation, and cooling sinks, and produces detailed plots and images showing thermal expansion (strain) and temperature profiles from the surface down through the bulk of the silicon crystal. 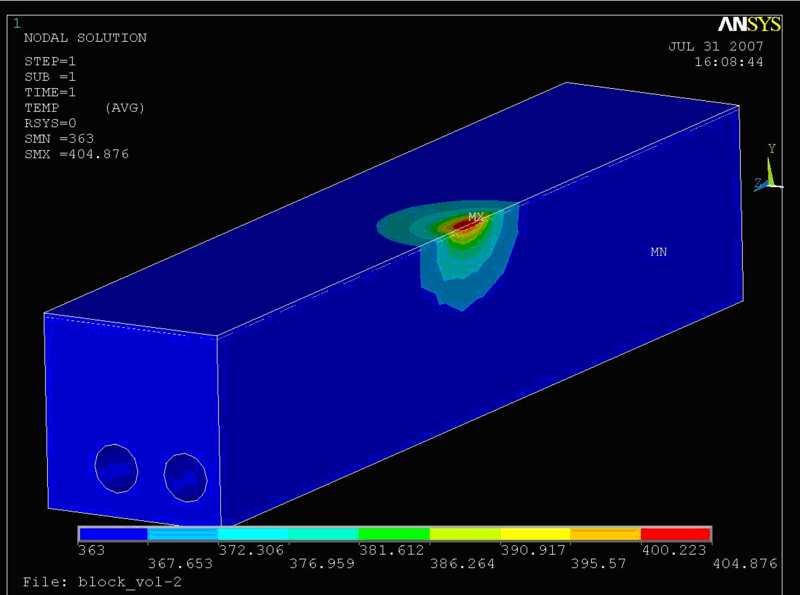 Using the input from Windisch’s “heatbump.m” program, ANSYS generates thermal profiles for the silicon crystal x-ray optic (above) as well as strain maps (not shown). This model shows a maximum temperature in certain cases of approximately 400 degrees Kelvin. Water cooling channels are modeled at lower left. In addition to their own research, students learned about other areas of science with guest lectures by Cornell faculty on “How Trees Transpire - Lessons from Building Artificial Leaves,” and “Energy and Fuel Cells: Demos and Thoughts about the Future,” to name a few. They had a series of “Fun Talks” and “Nanotalks” over lunches and were invited on outings to Niagara Falls and New York City, among other social events. The students closed their presentations with sincere gratitude to their mentors and sponsors, especially thanking the National Science Foundation for providing undergraduates with true research experiences. From the quality of work presented it is easy to see that undergraduate REU projects are highly valued parts of on-going and future accelerator and light source technology developments at Cornell. This material is based upon work supported by the National Science Foundation under Grant No. 0552386.